If the word doesn't exist, invent it; but first be sure it doesn't exist. Learning outcomes are measurable skills or attitudes students should gain from a course or an assignment. They might also be understood as levels of cognitive knowledge that we hope students will achieve. The act of writing can, in itself, develop knowledge and skills. Learning outcomes should be clear both for a course and for an assignment. Ideally, assignments are structured so that students can build complex skills step by step. In reality, as they learn new skills, some of the older skills may temporarily, suffer. We commonly see this in writing with grammar and other basic skills. As students learn new forms of writing or focus attention on difficult new content, their basic writing skills may suffer. The best response is to encourage plenty of editing and revision, for example, by having students work on drafts in class or building in early due dates for drafts that get formative feedback. Below are exemplary outcomes statements taken from W and C Course Syllabi. This course is writing intensive and satisfies the writing component required by the University for the Nutritional Sciences major. Good writing* is essential to effective communication and is inseparable from content. Accurate facts written in an unorganized or unclear manner are wasted. Therefore, writing quality will be considered as part of every written assignment’s final grade in this course. A significant portion of this course will be devoted to giving you the opportunity to refine your own writing skills through class assignments. Since this course satisfies a university “W” requirement for this major, students will not receive credit for this course without passing the writing components of the course. *By “good writing” I mean standard edited American English for mechanics (grammar, punctuation, spelling, word usage); clarity of organization and argument; tone appropriate to the audience; and accurate content. Poorly written assignments will not be graded and will be returned for re‐writing; deductions will be assessed. Designated as a writing course, DCED 401 will fine tune writing skills through various graded and ungraded writing observations and assignments. Through these assignments, the technical aspect of writing and critical thinking skills will be homed in on, expanding the student’s understanding of dance pedagogy. Communication Assignments: As a communication-intensive (C) course, BIOL 388 incorporates extensive writing and oral communication assignments to demonstrate knowledge of course material and to reinforce learning of physiological principles. Therefore, the communication portion of the course will have four graded writing assignments (including an independent research proposal) and one oral presentation associated with the independent laboratory projects developed by students during the semester. Details of the writing assignments and oral presentation will be provided in the laboratory sessions. Develop a conceptual understanding of the key issues involved in selecting human resources in organizations. Develop the knowledge and skills necessary for both creating and implementing employee selection systems in organizations. Develop a strong value for evidence-based approaches to decision-making and their potential for improving the quality of employee selection procedures in organizations. Demonstrate the ability to apply evidence-based approaches and professional standards to evaluate employee selection systems in organizations. Improve writing, public speaking, teamwork, critical thinking, and discussion skills through course requirements and class activities. A document or speech might have one of these aims (or a variation thereof) as a primary goal; on the other hand, some have multiple aims. From this list, it is clear that by writing a document or planning a speech with one of these aims, students also practice skills such as argument, communication, or critical thinking. Again, several modes may be present in a given document or speech, but one may dominate. One advantage of using the modes to develop learning outcomes is that many rhetoric texts provide help in writing based on the modes. For example, the typical handbook will include sections on writing a "Comparison/Contrast" essay or an "Extended Definition"; some writing textbooks also provide samples of writing that primarily demonstrate one of these modes. A proposal might define a problem (definition mode); assert the consequences of inaction (cause/effect); or explain how a similar problem has been solved (analogy). The document's aim would primarily be to persuade, but it could also explain and perhaps evaluate. Walvoord, Barbara, and Virginia Johnson-Anderson, "Making Assignments Worth Grading" in Effective Grading: A Tool for Learning and Assessment, pp. 17-26 (San Francisco: Jossey-Bass, 1998). Angelo, Thomas A. and K. Patricia Cross. 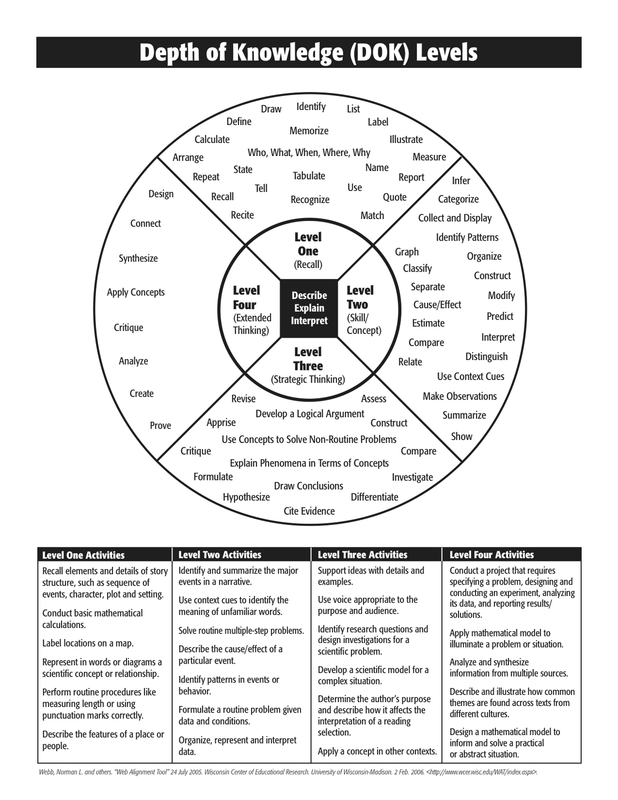 "The Teaching Goals Inventory" in Classroom Assessment Techniques. pp. 13-23 (San Francisco: Jossey-Bass, 1993). Also useful is Bloom's Taxonomy (Vanderbilt University Center for Teaching) and the Depth of Knowledge levels (recommended by Texas A&M Center for Teaching Excellence).